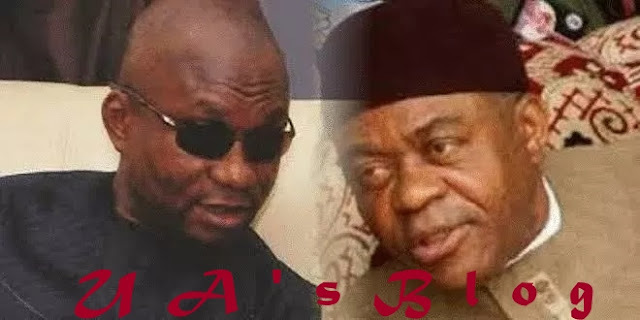 The Economic and Financial Crimes Commission, EFCC, has arrested and detained the former governor of Abia State, and currently Senator representing Abia central, Theodore Orji and his Son, Hon. Chinedum Orji (Ikuku) who is a member of Abia State House of Assembly. Recall that the former governor was grilled in Abuja on 21st of November before this recent arrest this week. We also gathered that two bank managers were also arrested in Abuja with the ex governor since two days over the alleged N27bn fraud. A live programme on Love FM, Umuahia which the former governor was supposed to feature yesterday was cancelled as he couldn’t make it because the EFCC didn’t allow him to go. His son, Chinedum Orji who is a majority leader at the Abia state House of Assembly is said to have a hand in the mismanagement of the funds as he is also being grilled by the EFCC in Abuja. We learnt that among the allegations levelled against the former governor was that he diverted billions of naira disbursed to Abia State by the Central Bank of Nigeria for Small and Medium Enterprise. Orji allegedly used the funds to buy properties in Abia, Port Harcourt and Abuja, and abroad some of which the EFCC is planning to seize.